Ajay Kumar Meher, Head – IT, Digital Technology and Broadcast Engineering, Sony Pictures Networks India, talks about what it takes to stay ahead of disruptive competition. The broadcast media in India has new challenges to cope with following the explosion of audiovisual content on digital platforms. 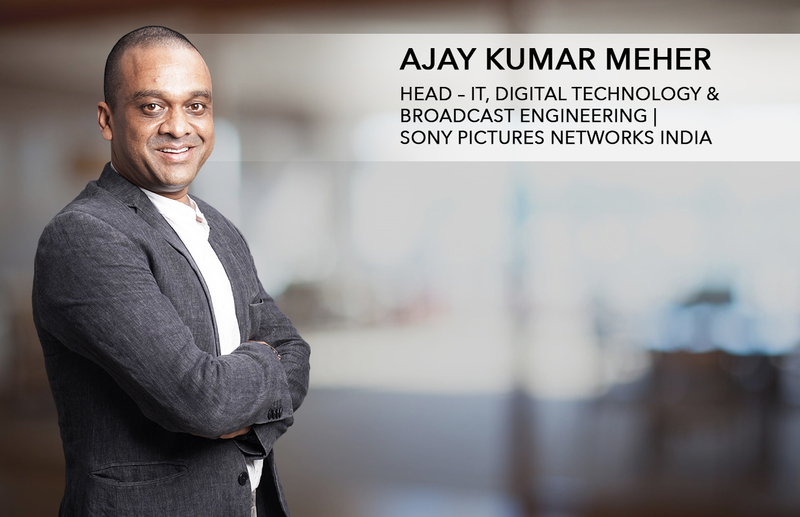 Ajay Kumar Meher, Head – IT, Digital Technology and Broadcast Engineering, Sony Pictures Networks India, spoke to us about how traditional channels like Sony are coping with disruptive competition from the digital world. What are the biggest challenges facing the broadcast industry today? Internet-centric businesses are challenging traditional businesses in every industry today. So is the case with broadcasters too. The competition is not among broadcasters, the competition is coming from digital native content OTT platforms such as Netflix, Amazon Prime Video and also from various other industries, such as telcos offering digital OTT platform like JioTV, Airtel TV, etc. So the competition is coming from all across and to grow in the B2C game it’s critical we have certain competitive advantages, and bringing the consumer to our own platform is paramount. How has been your experience in building a digital platform for Sony? Building a digital platform from a B2C point of view is not very easy. We must look at every aspect of a B2C platform, such as the right user experience and interaction, suggesting the right recommendations and, of course, providing a platform that is technically scalable, secured and operational as per expectations. The above is hygiene, we also have to see how to capture information while consumers are using the platform and monetise it. Apart from pure play digital offerings we are focusing on having engagement platforms on digital devices that will work while the consumer is watching content on television. Digital transformation for us involves understanding our consumers through analytics to gain actionable insights. We then deploy technologies like AI and machine learning to enhance productivity and drive monetisation. Today we receive huge amounts of consumer data. Analysing and interpreting the data will help us better understand consumer preferences and content consumption trends. This will help us create content based on what viewers like and what works for us as a channel. By analysing subscribers’ information we can find out about purchase behaviour. We can then create content to gain more subscribers. Data is helping us push recommendations, drive targeted content and enhance content discovery. What defines competitive edge in your business? Redefining the business in a digital era is quite critical and we have redefined ourselves as a content organisation and the presentation of that content can be through any platform, be it TV, digital or any other screen. This is a change in mindset, to say that we are in the business of disseminating content. We have started analysing where our content is going and how we should innovate to gain an edge over our competition. And competition today can come from anywhere. It’s no longer restricted to broadcasters. Digital OTT platforms are also competing in the same space. So the differentiation here is content and consumers. We have been into content play for several years and that is our strength. Now we are focusing more on consumer behaviour, what they like to watch and their willingness to pay for content. That’s where analytics will provide an edge over others. What sort of technology initiatives are you talking about while you grapple with customer engagement? We are looking at how to integrate virtual reality into content in a big way. We are also looking at hologram and cloning technology to significantly enhance the excitement factor. Anything technology can do to deepen customer engagement would interest us. How do you see AI and machine learning impacting your business? These are great enabling technologies that will help us package content like never before. For instance, we can virtually bring a celebrity onto a show when he/she is not available to travel. This is what we would like to work on more and see how AI can enhance the content viewing experience. Also, machine learning can help a lot in information input when content is coming up. We have to fill up a lot of information in real time and this could help there. We can for instance use machine learning to create subtitles, dubbing etc.